Discussion taking place at the Architectural Association. A talk which took place at the Architectural Association to launch the new Arts Foundation Award for Experimental Architecture is now available online here. The finalists for the award Holly Hendry, Chris Hildrey, Lawrence Lek and Finn Williams from Public Practice introduce their very diverse practices and explain how their work is affected by their visions of space in today’s world. Following this is a discussion with Justin McGuirk from the Design Museum and Minimaforms’ director and educator from the AA Theo Spyropoulos around what new meanings are architecture, art & design bringing to address spatial issues and what role does experimentation play in contemporary practice. 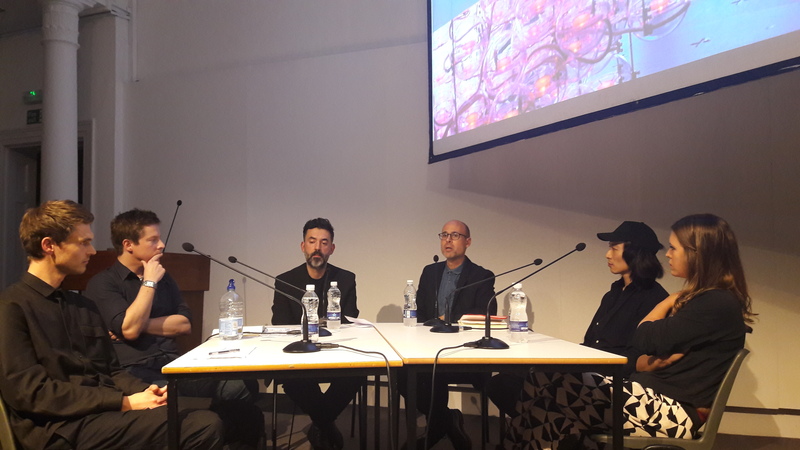 The talk launched the exhibition, Pushing the Boundaries: 2019 AFFA Finalists for Experimental Architecture bringing together for the first time four very diverse practitioners whose experimental work explores radical constructions challenging our conceptions of space as an interface. The video includes visual displays of their work on screen.